The following interview questions and answers will soon be published in the August/September issue of Retailing Insight. What product in your line is your pick for #1 holiday bestseller? 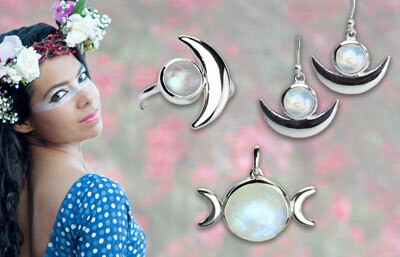 Moonstone is always a customer favorite. Pieces in this collection has been a great seller. What four products in your line are your holiday bestseller picks? What is your best suggestion on how to create exciting displays of your products? Open the door to your store as if it is the first time you ever entered. How do you feel? To promote optimum sales, ambience is key. The atmosphere should pleasantly entice customers to want to explore your store to discover matchless gifts. When they feel as if a treasure chest of wondrous delights is spread before them, they will not want to leave without first owning some part of it. Creating that first magic moment guarantees a purchase from each person that walks through your door. To kick-start sales, put your best foot forward! Higher-end items attract attention. Place them where they are clearly visible, towards the front and center of your store. Move them around often to keep your store fresh and exciting. It motivates more profitable sales when customers contemplate your newest, special items first. Never be ordinary! More than ever, people are seeking products with lasting value that cannot be found everywhere else. They much rather invest their money on something that holds its worth. When you supply genuine gifts of importance, it keeps customers talking and merchandise moving. When they purchase your superior goods, you gain their longstanding loyalty and trust. It keeps everyone winning. Where do you find your inspiration in your work? I grew up on a beach in New England where every morning the awesome colors of the sun rising over the horizon was a cherished happening. I would watch as the sky and sea played in different moods, always creating extraordinary beauty. I loved to find sea shells and sea glass to make little gifts for people as an offering of love from mother nature. 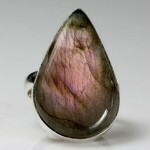 Working with genuine gemstones evolved naturally for me. The variations of their colors and textures are reminiscent of the sky, sea, mountains and flora. My inspiration to continuously come up with various color combinations and designs reflects the ever changing seasons and times. Being from India, my husband knew artisan families who worked with sterling silver jewelry for generations. 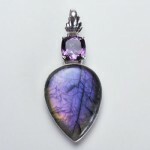 They skillfully combine my designs with the gemstones I chose to create our exclusive pieces of wearable art. It is very rewarding to see them grow along with us. Some had been working their trade on the streets. Now they are able to provide their families with nice homes and education. They are happy to have work with constantly evolving new designs, and I am enlivened to work with them as both our lives become enriched. What’s the one thing you wish retailers knew about you or your business? We are known for our exceptionally high quality, sparkling gemstones. 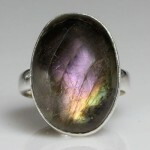 We offer the best clean, glowing Rainbow Moonstone and Labradorite ever. 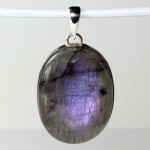 I search for unique gems that will thrill your customers like Spectrolite Purple Labradorite, Pink Morganite, Peacock Blue Apatite, Clear Herkimer Diamond Quartz, Sparkling Opal, Ocean Blue Larimar. Visiting clients around the USA keeps me updated and in touch with the latest styles and price points that will generate quick and profitable sales for you. By staying alert with the ever-changing business climate of the times, I am able to provide the most versatile quality jewelry pieces at prices that are hard to beat. My designs attract Millenials to Baby Boomers. My family is involved in supporting education and care projects in Indian villages. We carry that consciousness of caring to everyone we work with, from our fairly trade artisans to our customers. We assure the integrity of our product, work ethics and friendly personal service. What special holiday discounts should our readers know about?